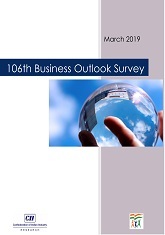 CII’s 106th edition of quarterly Business Outlook Survey is based on more than 200 responses from large, medium, small and micro firms, covering all regions of the country. The CII Business Confidence Index (CII- BCI) for January-March 2019 quarter improved significantly to stand at an eight year high of 65.2. The index improved 6% from the previous quarter reading of 61.8 and the latest reading marks the fifth consecutive month when the index stands above the level of 60, signifying upbeat business sentiment. Major proportion of the respondents (44 percent) expect GDP growth in the 7.0%-7.5% range in 2019-20, followed by 21 percent who feel that GDP growth may stand at a higher level of 7.5%-8.0%. This is largely in line with the RBI’s projection of 7.4% growth in GDP in 2019-20. More than half of the respondents (51 percent) feel that inflation will increase, over the previous year levels, in 2019-20, while a quarter of them (25 percent) foresee no change in inflation rates in 2019-20. Around 34 percent of the respondents anticipate a cut in policy rates in 2019-20, of which a major proportion (27 percent) foresee a 25 bps cut while about 7 percent expect the RBI to lower policy rates by 50 bps. A large proportion of respondents (42 percent) are of the view that the government may not be able to meet its fiscal deficit target of 3.4% of GDP for 2019-20. This sentiment may be on account of the government’s front loaded expenditure announcements, in the Interim budget 2019, which may not be matched by adequate avenues of revenue generation.